Electing to take a gap year or career break is a bold and exciting decision. We understand the complicated process of planning and successfully executing a gap year and eagerly work to provide excellent service to every family. Founder Julia Rogers has over ten years of gap year advising under her belt and is recognized by the Gap Year Association as an expert gap year counselor. As a gap year specific consultancy, we dream, live and breathe gap years – it’s our specialty! In the summer of 2018, EnRoute Consulting became the first-ever gap year consultancy to receive professional accreditation through the Gap Year Association. 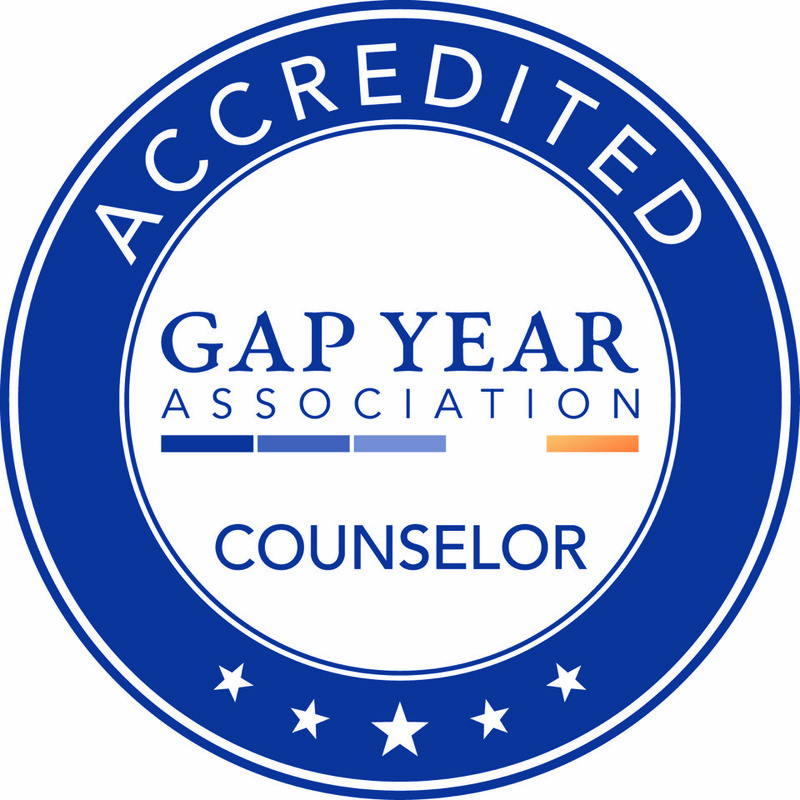 In order to earn a GYA seal, a counselor must show demonstrated excellence in the field of gap year consulting and pass all required Standards for ethics, responsible advising, and risk management in gap year education. This includes sharing evidence in the 30 separate Standards of Accreditation. We value the fact that each student is different and Julia enjoys developing a unique relationship with every student. We also support parents with what can be a challenging process – that in which you want to balance enabling independence with ensuring a meaningful gap year. We offer full-length packages that offer support for the length of the designated gap time. In our experience, this structure is the most beneficial for the student. It allows Julia the time to get to know a student, guide them through the planning process, help them prepare and be available throughout the year should plans need to be adjusted. Our goal is to empower a student to make the decisions about how to spend their gap time within a framework that is decided upon as a family. 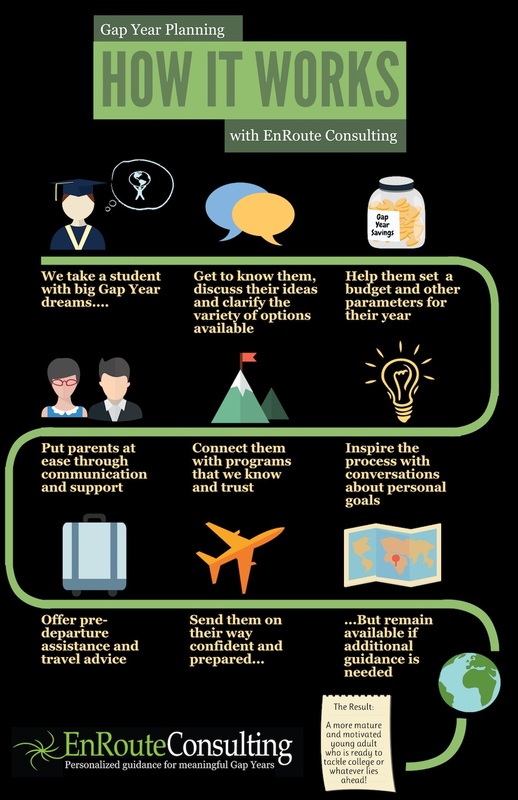 Julia connects with students about their gap year dreams, and helps them make responsible, feasible choices that maximize the power of this special period of time. The crux of our process is making personalized recommendations from EnRoute’s database of programs. Every program in our database has gone through a vetting process that includes an interview, reference checks and other due diligence that most families do not have time for. In certain instances, Julia has even vetted the program on-site! Julia has high standards, and only recommends opportunities that demonstrate the best in student experience, risk management and ethics. 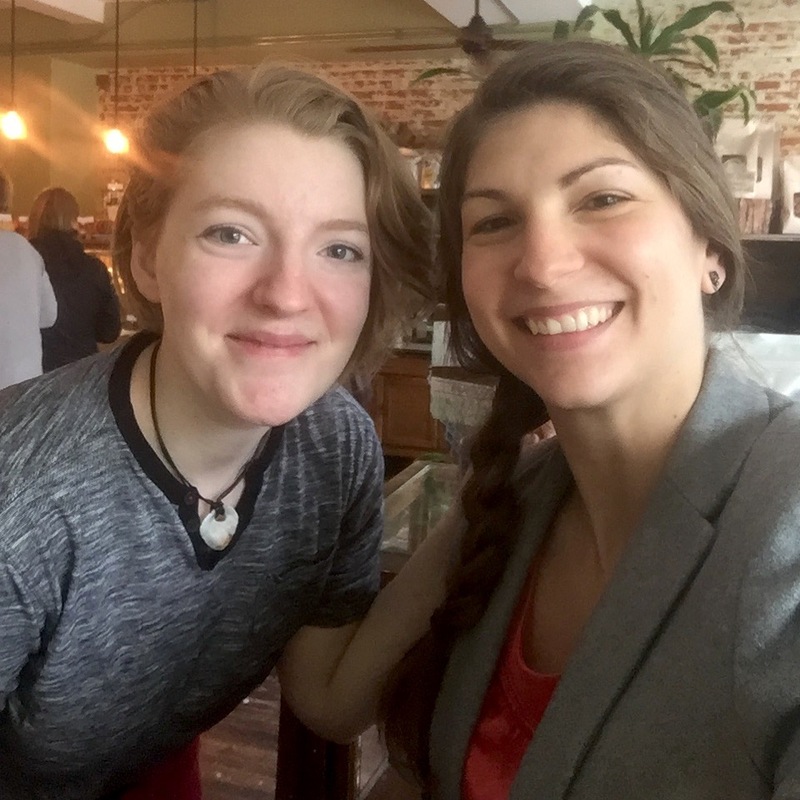 After getting to know a student, Julia makes recommendations tailored to that student’s personality, thus bringing the field of options into a more manageable range. For more independent experiences, we work with families to determine the comfort level and guide the student through preparing to make it the most positive experience possible. Here is a handy infographic that illustrates our advising process. You can also read testimonials from past families, learn more about our guiding principles or get in touch to set up a conversation! Google estimates about 27,000,000 hits when you search “gap year program” on their search engine. Sifting through the thousands of gap year opportunities is time consuming and can be very frustrating. EnRoute provides options that are already tailored to your individual needs. At EnRoute, we carefully research organizations of interest to our clients, discarding disreputable groups through a thorough vetting process. This includes speaking with the directors of programs as well as returned students, who provide valuable, unbiased information on their experiences. This assures our clients we have gone to great lengths to work with trustworthy organizations. Conversing with students and listening to them articulate their passions, goals and hopes for their gap year encourages them to make deliberate decisions on how and where to spend their year out. EnRoute consultants identify with the desires of students as well as the concerns of their parents. We happily work with both parties to ensure everyone is satisfied with the opportunities presented. EnRoute networks with organizations, returned gappers and other consultants to provide the best knowledge of programs, opportunities and experiences available. Our consultants use a database of pre-approved programs, providing us with the ability to find responsible opportunities for our clients. Whenever we recommend a gap year program or opportunity, you will have the peace of mind of knowing it has been properly researched. We do not accept finders fees or commissions from organizations we recommend. Our recommendations are based on our commitment to the best fit for an individual client. EnRoute Consultants have first hand experience with gap year travel and bring this wisdom to the planning process.